Employee Engagement is to HR what Customer Satisfaction is to Sales and Marketing. Employee engagement is the emotional commitment employees have toward their company and the goals of the company. When we’re engaged or emotionally committed, it means that we’ll give discretionary effort, thus we go the extra mile. Engagement drives performance for individuals, teams and organisations. 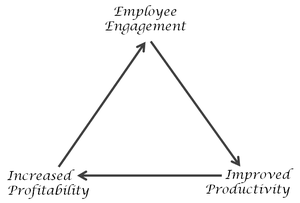 Employee engagement is about drawing true value from truly engaged employees. It is about positive attitudes and behaviours leading to improved business outcomes and essentially increased ROI. Not only do we measure employee engagement by means of employee surveys but we offer a complete solution. Guided by the structure and basic principals of the Six Sigma DMAIC process, we can help align employees to your company goals in order to achieve maximum employee contribution. We partner with you through each phase of your employee engagement journey. The employee engagement process is cyclical, which means that the DMAIC procedure is repeated to determine whether changes made are effective , sustained and continuously improved. It is also used to determine which actions worked, and which did not, and adapt your strategies accordingly. Project elements are defined in this phase. During the measure phase, both qualitative and quantitative data is collected through anonymously completed employee surveys. Surveys measure various dimensions such as company leadership and work environment which all contribute to overall employee engagement. Data is analysed and key areas for improvement are identified. Controls are put into place to monitor and review. In this step, you follow-up on your implementation process to see if they’re taking effect. Use regular targets, usually monthly or biweekly, to determine results. Continue this cycle and continuously improve. We can help you improve Engagement! Engage with us! Have you have ever considered the cost of ignoring Employee Engagement? Worldwide studies show that only 13% of employees are truly engaged at work. In South Africa, the 2016 Gallup survey produced alarming findings: only 9% of the workforce is actively engaged. Of the 91% who were disengaged, 45% were actively disengaged. It is essential that the focus of companies is to improve, not only measure, engagement. If they are committed to acting on the results of the surveys, employee engagement will increase as a result of these actions.